In the tradition of great tales of men against the sea, this story offers a compelling look at courage and commitment in the face of certain tragedy. It is a powerful blend of human drama and real-life naval operations, but unlike most books in the genre, its heroes are airmen not seamen, and most survived their ordeal. 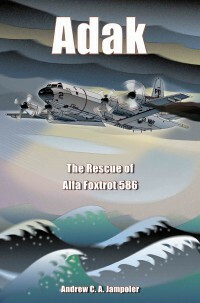 Published on the twenty-fifth anniversary of Alfa Foxtrot 586’s fatal mission as a tribute to those lost, the account was written by a naval aviator who has flown the same aircraft on the same mission from the same naval station. The aircraft is a P-3 Orion on station during a sensitive mission off the USSR’s Kamchatka Peninsula in the north Pacific. The time is mid-day on 26 October 1978. Andy Jampoler takes readers into the cockpit of the turboprop as a propeller malfunction turns into a succession of nacelle fires, eventually forcing plane commander Jerry Grigsby to ditch his patrol plane into the empty, mountainous seas west of the Aleutian Islands. His fourteen crew members, strapped in their seats, expect the worst—and they get it. Their aircraft goes down in just ninety seconds, taking one of the life three rafts with it. A second raft, terribly overcrowded, soon begins to leak. As night progresses, men begin to die from exposure to the fierce, penetrating cold. The flight crew’s desperate battle to survive is told with the authority, drama, and sensitivity that only someone with the author’s background could provide. He draws on interviews with survivors, searchers, and even with the master of the Soviet fishing trawler that saved the living and recovered the bodies of the dead. Jampoler also draws on recordings of radio communications, messages in the files of the state and defense departments, and the patrol squadron’s own investigation of the ditching. Everyone who likes survival epics and enjoys reading sea and air adventures will be entertained by this engrossing true story. Adak is available as an audio book. Sample Adak.